Great day for a birthday lunch at Heart and Hand restaurant in Clifton, Virginia. Haven't been here in years but was so glad it was such a nice day in the country. Michelle was celebrating her birthday and neither Deb or Michelle had been to the restaurant before ! 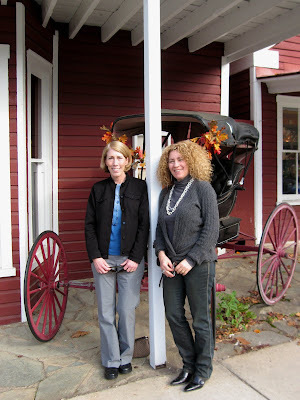 Deb and Michelle in front of the restaurant. This front entrance was used in the opening sequence of the movie "Broadcast News". An oldie but goodie starring William Hurt. The restaurant was also a favorite of Nancy Reagan and her pal George Will. But that didn't stop these die hard democrats from enjoying a great lunch. 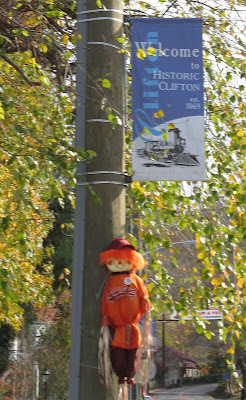 The fall leaves are on their way out but the scarecrow decorating all the lamp posts in downtown Clifton were capturing the festive spirit! 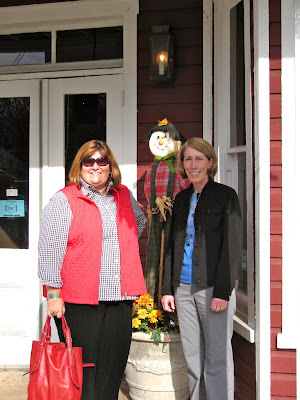 Marcia and Deb and a friendly scarecrow!!!!! We talked quite a bit with one of the managers of the restaurant and discussed the fact that their famous Heart and Hand cookbook has been out of print for many years. This cookbook is one of my favorites and one I turn to for many family favorites!!! I would buy another one in an instant - mine is so falling apart. And I would love to present a few to friends and my now-cooking daughters!!! They are trying to work out the details of who owns what copyrights - publisher, writers etc. When they do, we all have to get a new copy of that great cookbook!!! Until then I thought I would include my favorite tomato soup recipe in this post- Deb and Michelle sampled it at lunch! Happy Birthday Michelle!!!! Always fun to spend the day with those two!!!! Make a roux in large pot using butter and flour, careful not to brown. 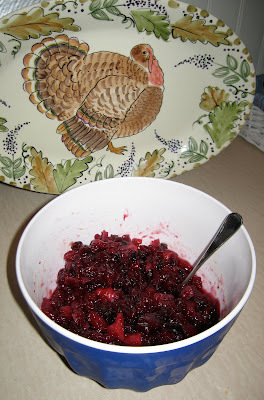 Add remaining ingredients, simmer 15 minutes. Garnish each serving with a dollop of sour cream and chopped green onions.